A 39-year-old woman was taken to the hospital with a back injury Wednesday after a Blue Line train derailed near O'Hare, authorities said. NBC 5’s Patrick Fazio reports. A 39-year-old woman was taken to the hospital with a back injury Wednesday after a Blue Line train derailed near O'Hare, authorities said. 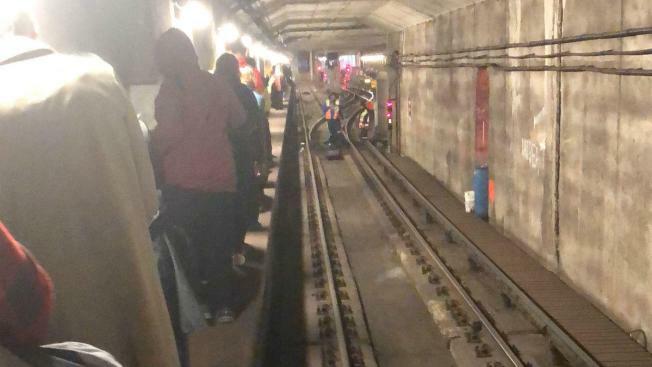 Seventy-three passengers were evacuated from the train after the train derailed about 7 p.m., the Chicago Fire Department said. “As a result, trains are operating only between Forest Park and Rosemont at this time,” the agency said. Crews were working to restore service in the area. The CTA warned commuters to allow for extra travel time or seek alternative routes such as nearby busses or other rail lines. The injured woman was taken to Resurrection Hospital. By 2 a.m., normal service resumed on the train line, but the transit agency still warned of residual delays for commuters.